When you think about what Germany is famous for, fast cars and good beer are likely to come to mind first. But there is another quality product that Germany is famous for: Sparkling natural Mineral Water. Now is your chance to learn more about a truly unique Mineral Water: Gerolsteiner. Not only is it the most popular Mineral Water in Germany, but it also offers loads of interesting facts and exciting stories. 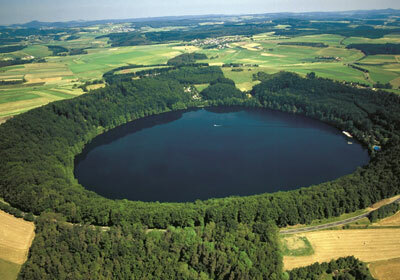 The region that Gerolsteiner Mineral Water originates from, the Volcanic Eifel in Germany, is of unique geological character. A Mineral Water of the highest quality evolves here thanks to the special combination of carbonic acid from prehistoric volcanic activity and dolomite rock known for its rich mineral content. As the water finds its way through the various layers of rock, every drop of Gerolsteiner becomes naturally carbonated. This is an important process, as the carbonic acid allows the water to absorb the precious minerals and trace elements from the dolomite rock. The water gathers at a depth of up to 200 meters, after filtering through various rock layers, retaining its purity and freshness thanks to the carbonic acid. To maintain this level of natural purity it is bottled directly at its source. Thus Gerolsteiner Mineral Water is a true miracle of nature – naturally pure and protected form outside influences. 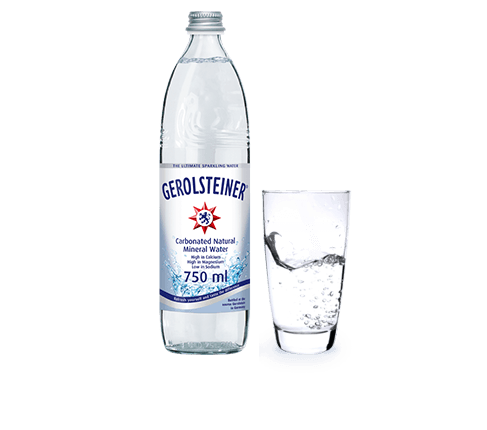 Gerolsteiner is a Mineral Water of outstanding quality. But what exactly makes it so special? The answer: It tastes good and it does you good. Due to its volcanic origin, Gerolsteiner sparkling Mineral Water inherently contains valuable minerals like calcium, magnesium and bicarbonate. It is thus beneficial to the human body, as each mineral has a specific effect on our health: Calcium is important for healthy bones and teeth, while magnesium strengthens your muscles and nerves. And due to its balanced content of calcium, magnesium and bicarbonate, Gerolsteiner Mineral Water tastes neither salty, sour nor bitter – but pleasantly natural and neutral. Preserving this great quality has always been Gerolsteiner’s highest priority. That is why the experts at Gerolsteiner carefully monitor every single production step – from sourcing to bottling, from labeling to loading. This way Gerolsteiner can guarantee that the Mineral Water you drink from one of the bottles is in the same condition as at its source: fresh and pure! When it comes to quality assurance, Gerolsteiner doesn’t only work to comply with strict legal requirements. Every day, up to 300 water samples are taken in order to guarantee an ideal mineral ratio and the highest level of purity. Furthermore, renowned institutes and laboratories conduct regular tests. The history behind Gerolsteiner Mineral Water goes way back: Gerolsteiner has been providing great Mineral Water “Made in Germany” since 1888. When the Gerolsteiner Sprudel GmbH was founded in 1888, the Mineral Water was still filled into clay jugs. In the course of history Gerolsteiner frequently played a pioneer’s role by introducing innovations to the German water market: In 1998 Gerolsteiner launched the first PET re-usable bottle and in 2011 Gerolsteiner was the first Mineral Water Company to deliver its water in 1.0l glass bottles. However, maintaining an international focus has always been of major importance to Gerolsteiner. 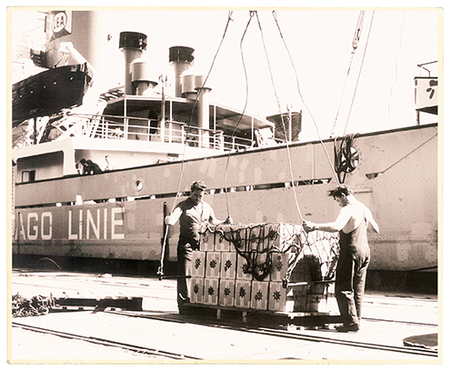 It was already during the early years that the company began selling its premium Mineral Water abroad. First in the USA (1890), then in Australia (1895), followed by the Benelux countries (1980s), Japan (2004) and many others. Thanks to its volcanic origin and the resulting outstanding quality, Gerolsteiner has managed to win over water drinkers in over 40 countries – and has meanwhile become no less than the world’s No.1 Sparkling Natural Mineral Water. In 2012 Gerolsteiner increased its efforts as Germany’s biggest Mineral Water exporter by launching the new 0.33l light glass bottle on the international markets – a perfect addition to the international portfolio round the 0.75l light glass bottle, launched in 2011. As natural Mineral Water is one of the most strictly monitored food and drink products in the world, it requires an official seal of approval. This seal requires the water to be extracted from an underground spring and bottled in its original pure form directly at the source. In order to ensure the stability of the mineral content and consistent quality, natural Mineral Waters must be checked regularly by independent institutes. Spring water is also obtained from underground water springs and is bottled directly at the source. However, its mineral content does not need to be consistent, nor does it require an official seal of approval. Just like water from your tap, spring water must have no odor, an acceptable taste and low microbiological contamination. 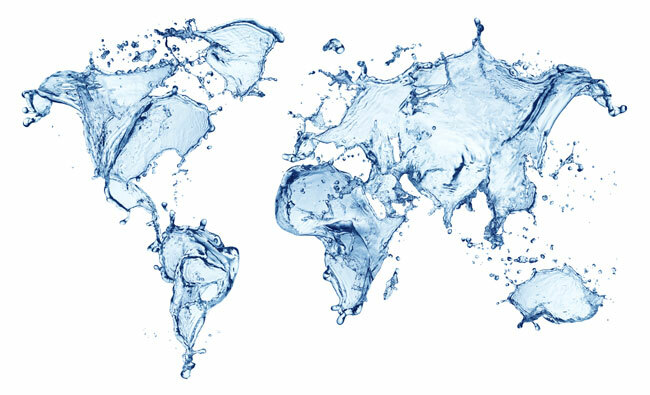 Purified water does not need to be of natural origin. It can be made from a variety of sources such as tap water, salt water, Mineral Water or a mixture of these. As purified water is not bound to a particular spring, it can be produced and bottled anywhere and offered in non-bottled form, such as on tap. Unlike Mineral Water, it does not need any kind of official seal of approval.